Watch How This Cheeky Pup Steals A Ball From Under Another Pup’s Nose! We all know just how much fun it can be to play with friends. You can get up to all sorts of shenanigans you wouldn’t otherwise be able to do – including messing around with your buddies! As you can imagine, pups aren’t immune to this either, as this video goes to show! 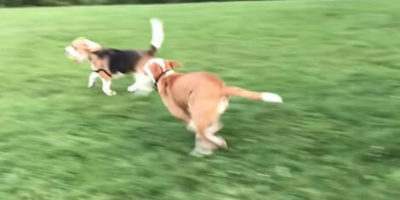 These pups were all having some fun and hanging out with each other in the local pup park, when Oliver the Beagle decided to get a little cheeky! While the pups were busy introducing themselves to each other, he quickly dived in and snatched up the tennis ball! The other pups noticed immediately, so Oliver had to run. He dashes across the grass, prized possession in his jaws, while the other pups chase him down! It is all in good fun, of course. Dad then later edits the video to show a play-by-play version of just what happened in those brief moments! This Adorable Pup Looks Absolutely Gorgeous In A Landscape Covered In Thick Snow!